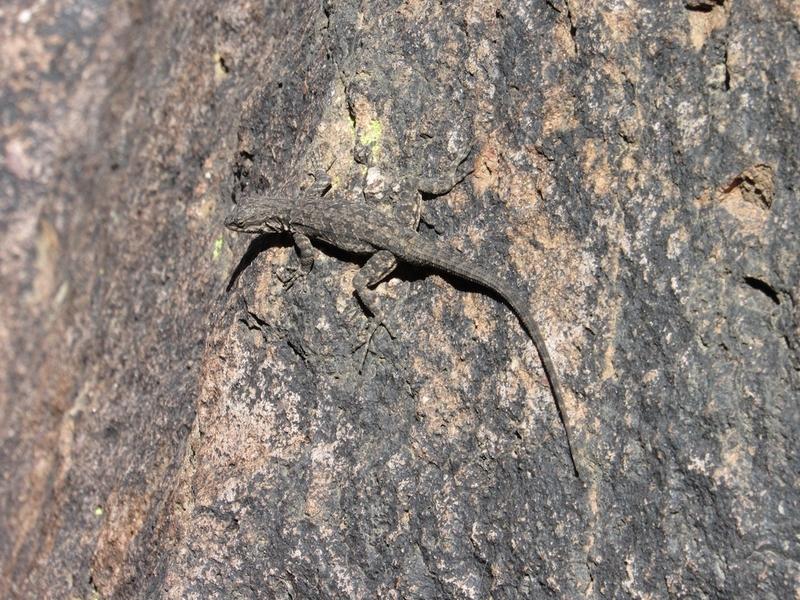 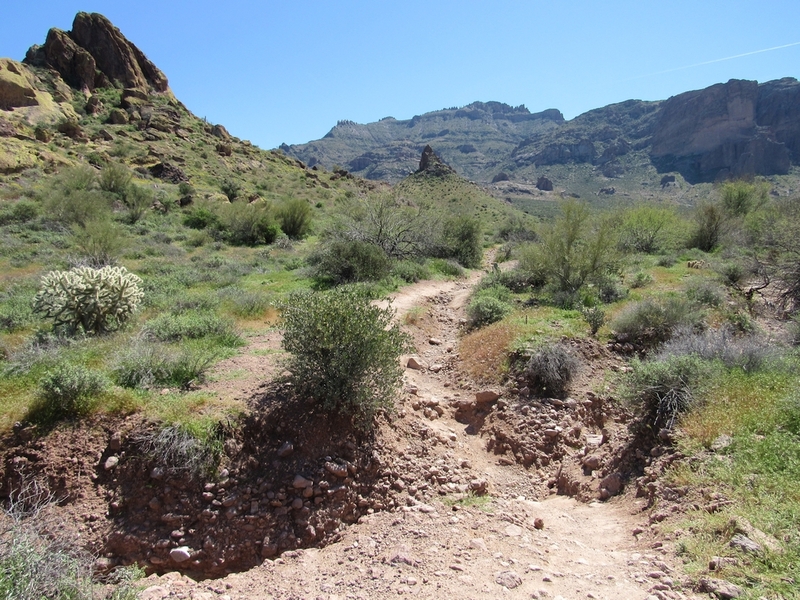 Legends of lost gold and buried treasure give a sense of excitement and mystery when visiting the Superstition Wilderness. 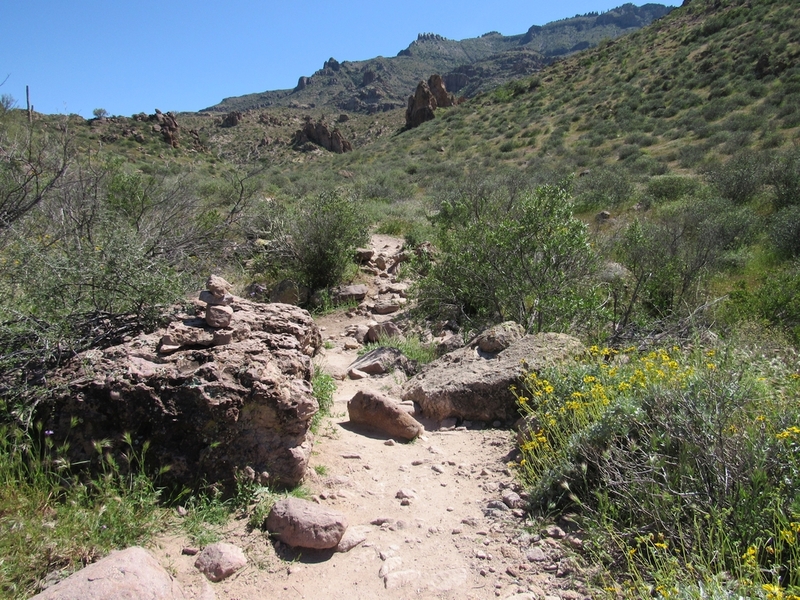 One of the most prominent legends associated with the Superstition Mountains is the story of the Lost Dutchman Gold Mine. 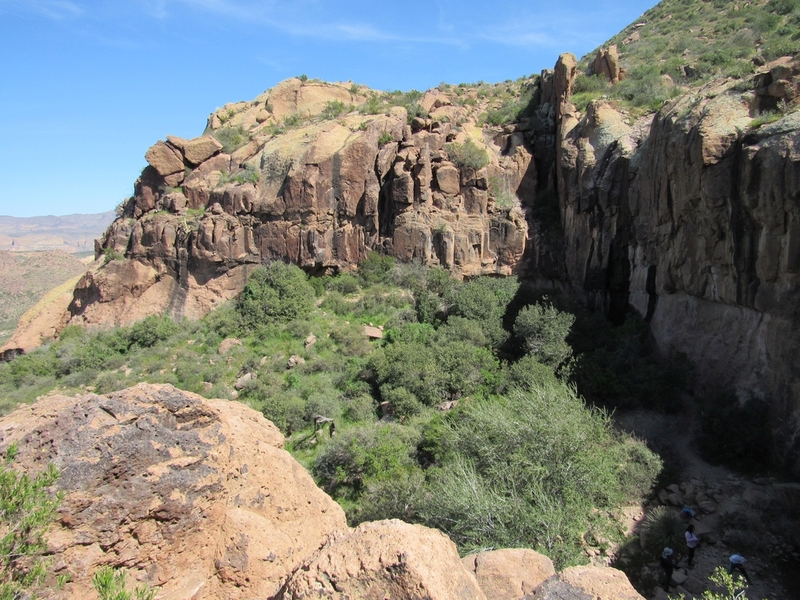 It is said that the Peralta family from Northern Mexico mined rich gold ore from the Superstition Mountains in the 1840s. 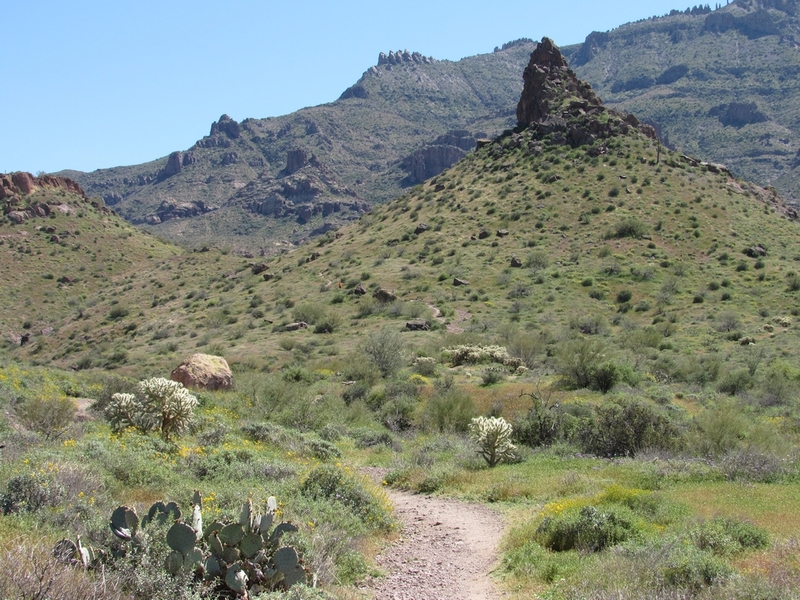 In 1848, during one of their expeditions to bring gold back to Mexico, the miners and their crew were allegedly ambushed, cornered, and massacred by the Apache. 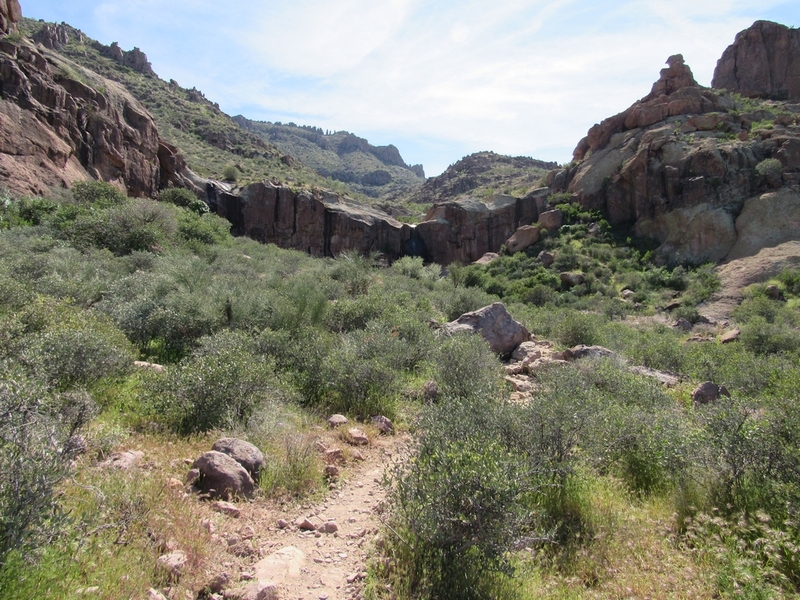 The entire mining party was killed except for a couple of members of the Peralta family who managed to escape. 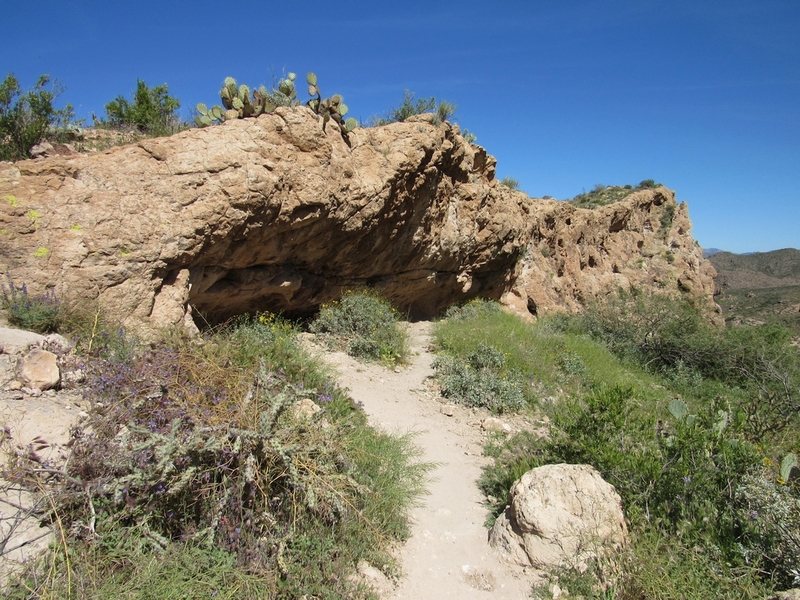 After the massacre, the Apache hid the gold and covered the entrance to the mine. 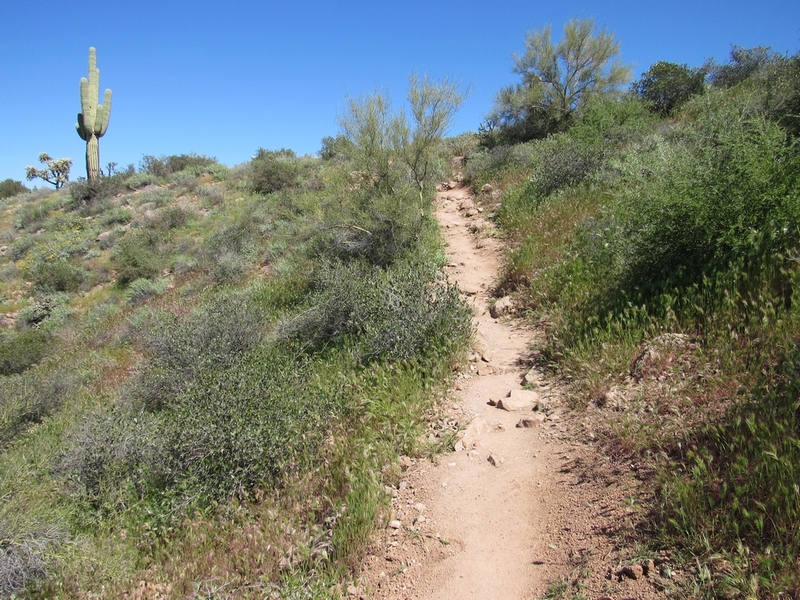 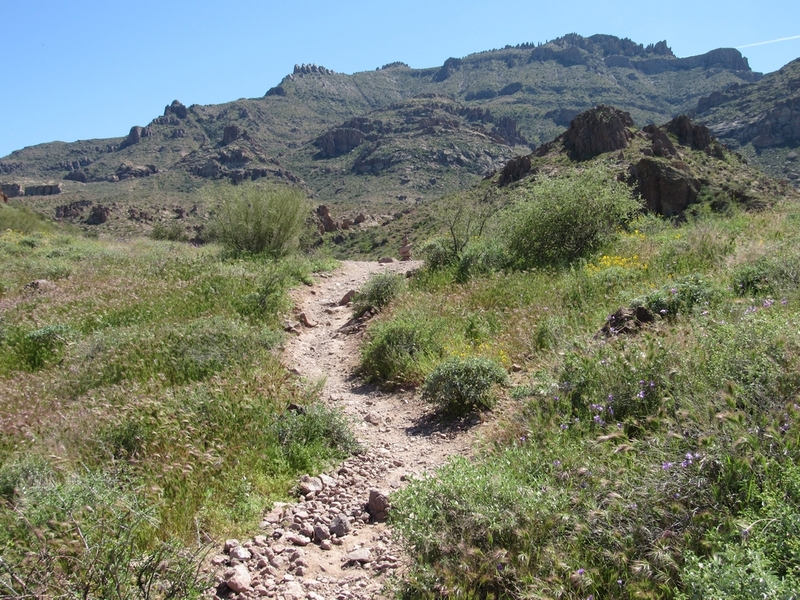 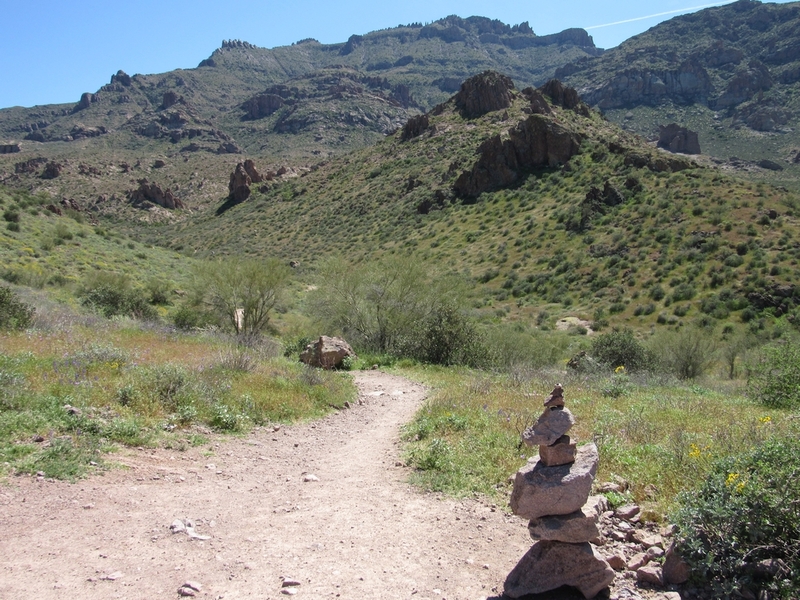 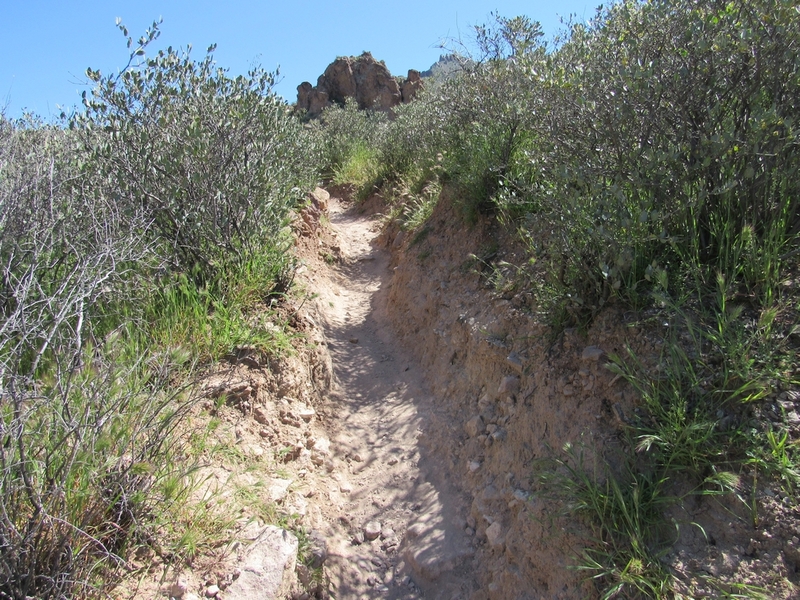 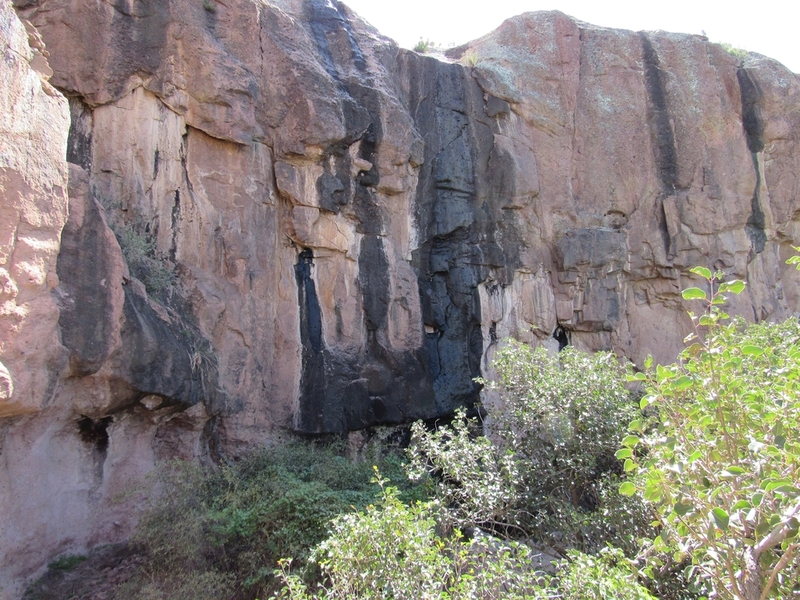 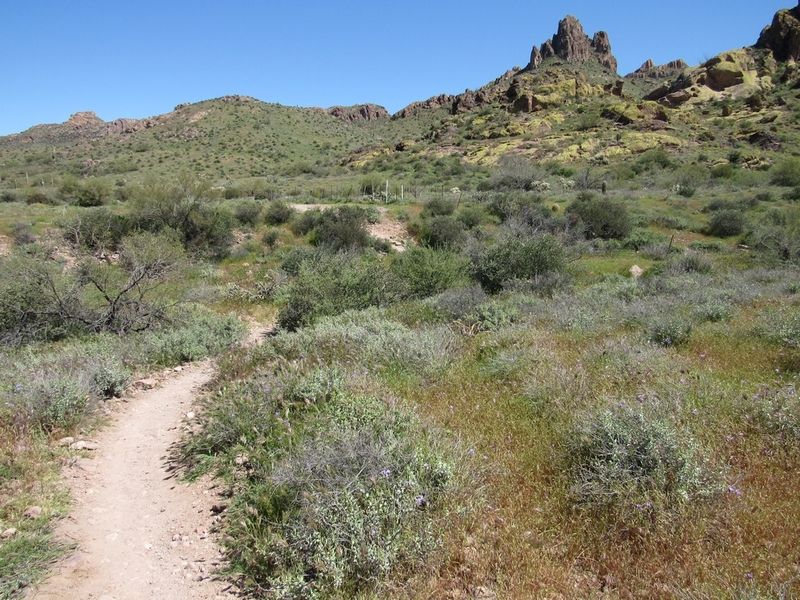 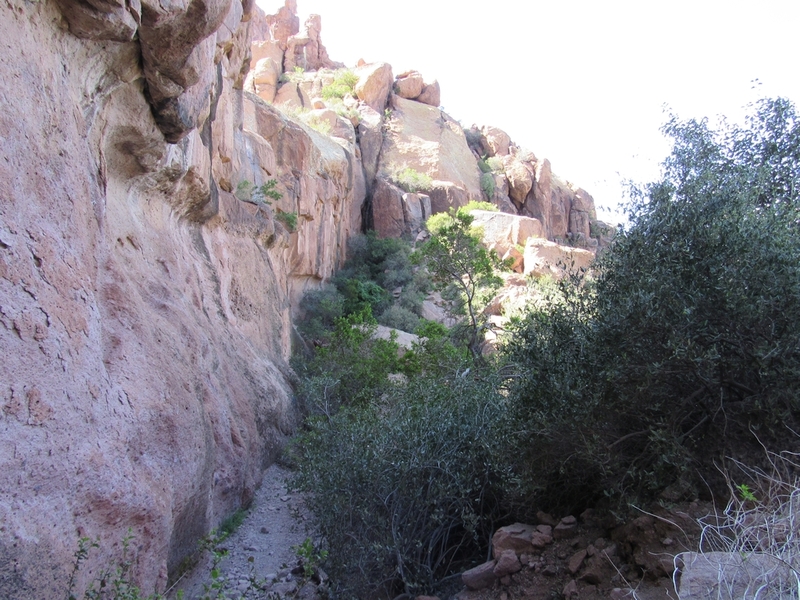 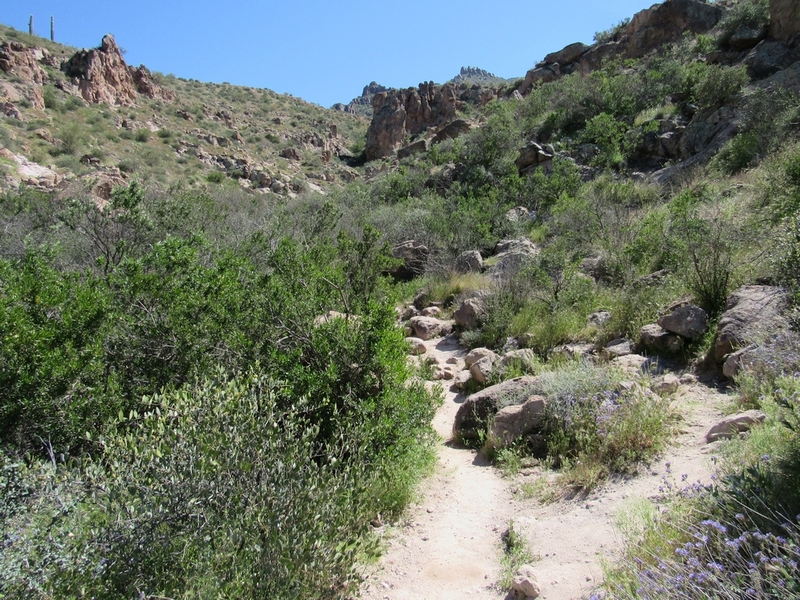 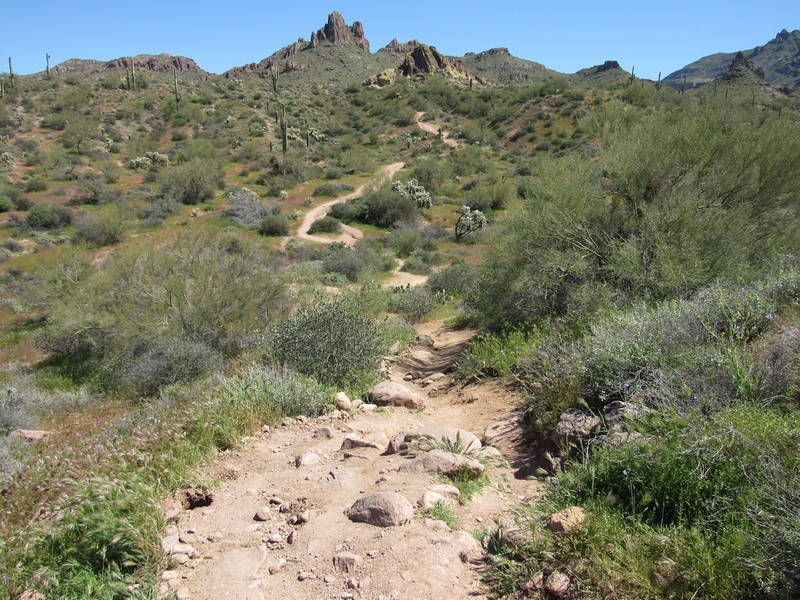 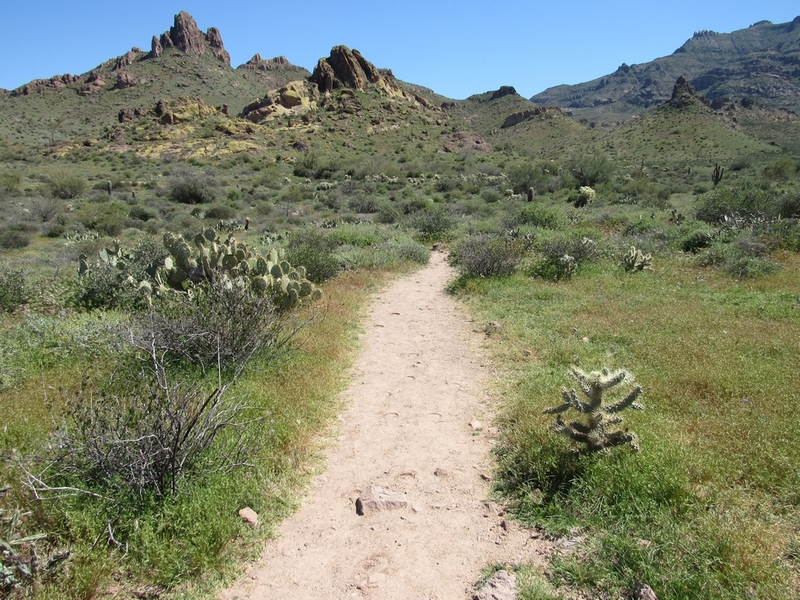 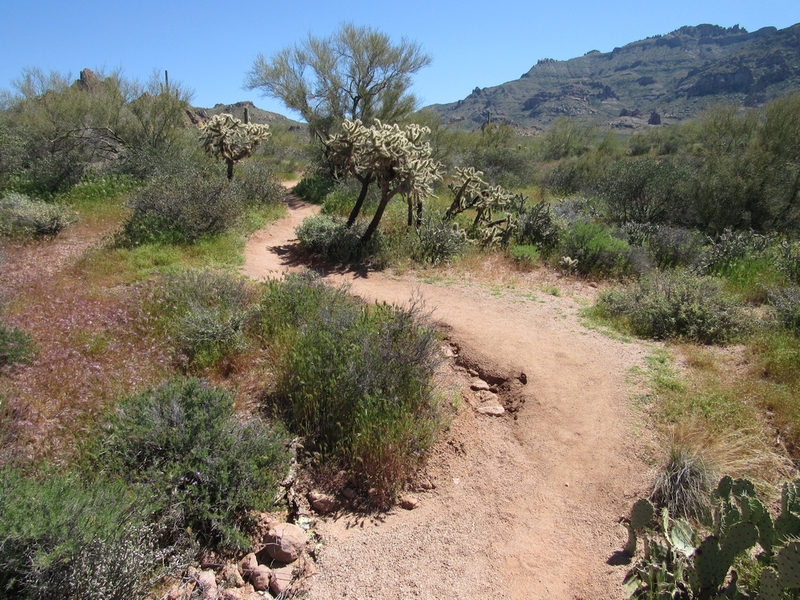 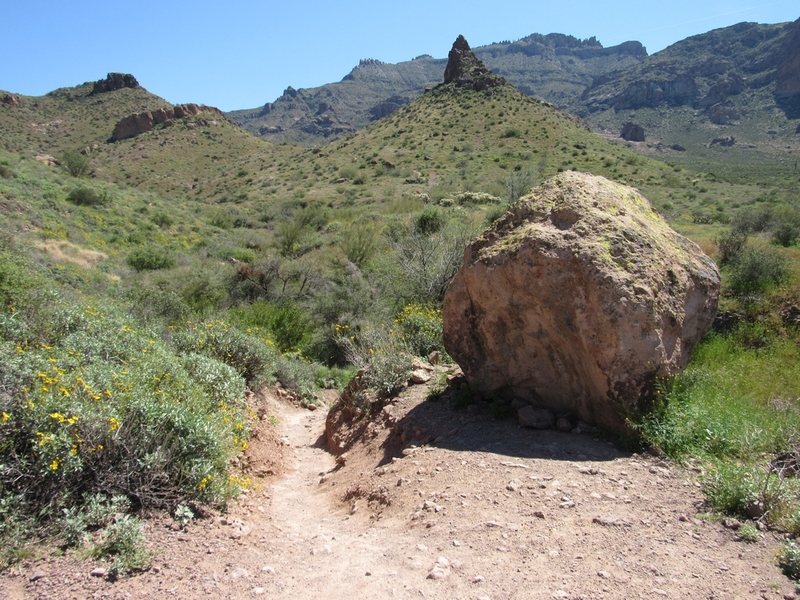 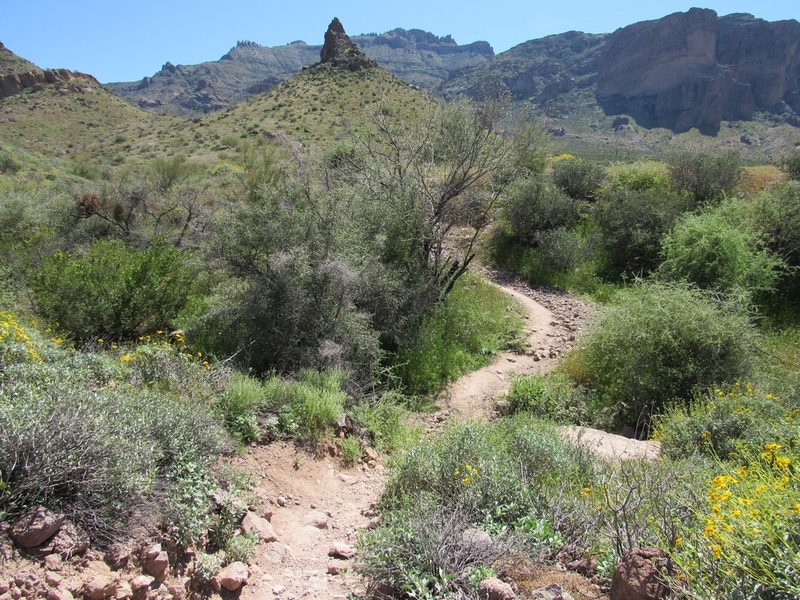 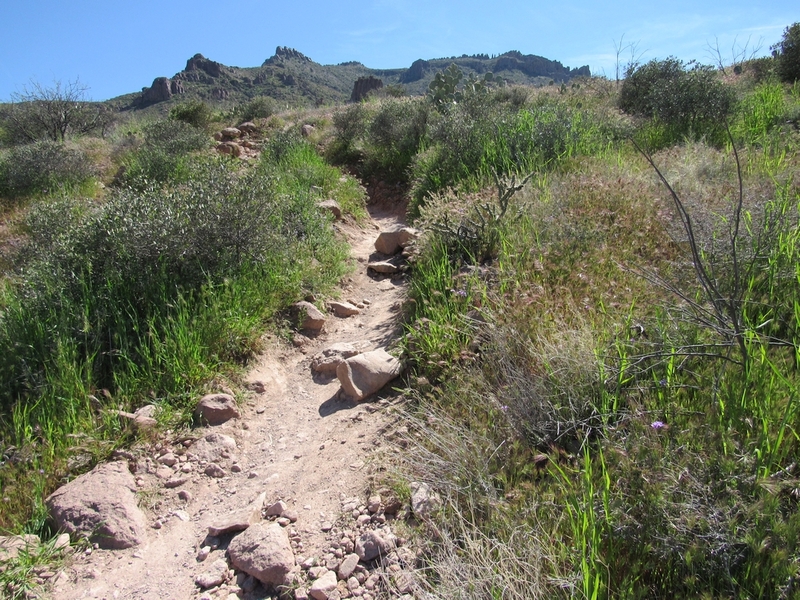 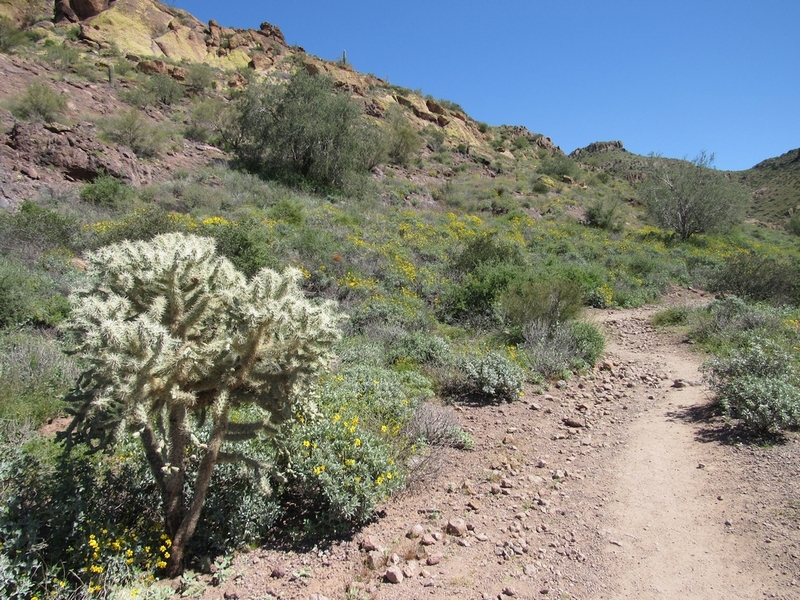 Massacre Grounds Trail is a moderate 5-mile out-and-back trail in the Superstition Mountains that leads to a seasonal waterfall, Massacre Falls. 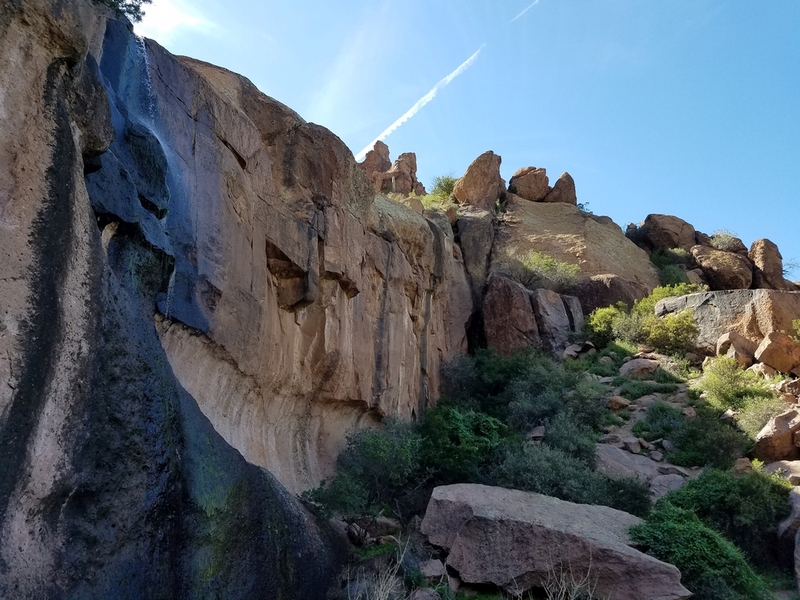 Despite the name, the hike to Massacre Falls is actually quite pleasant. 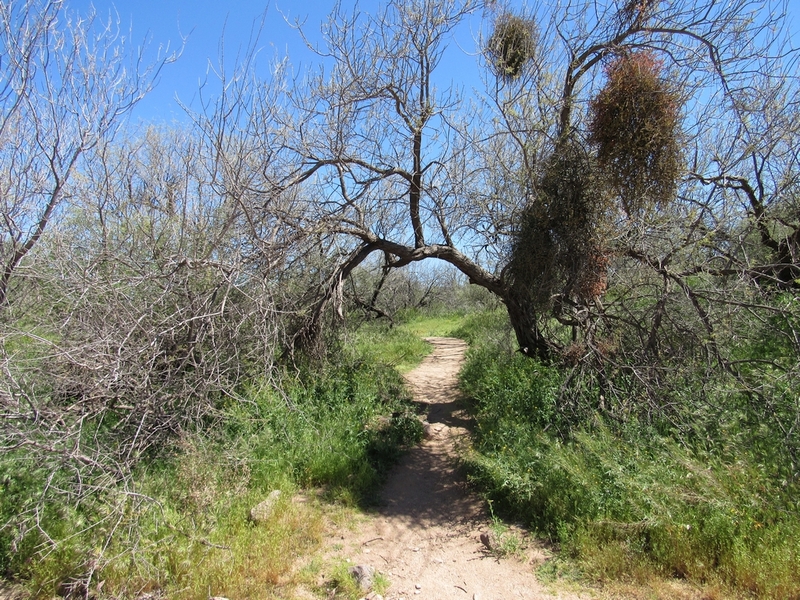 The original Massacre Grounds Trailhead is no longer accessible by vehicle. 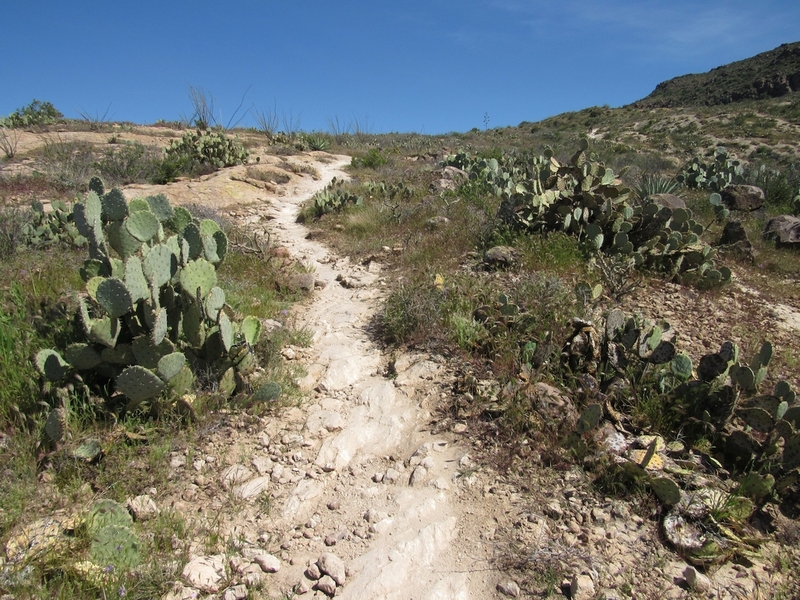 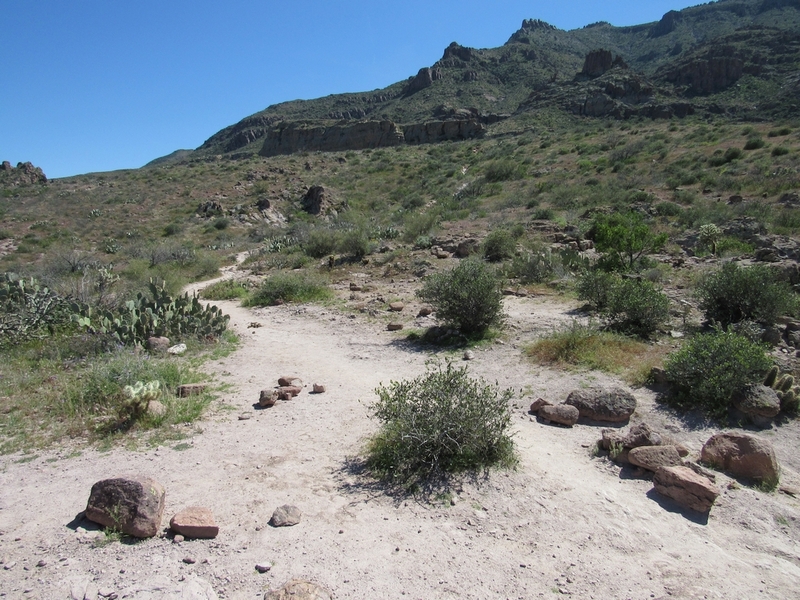 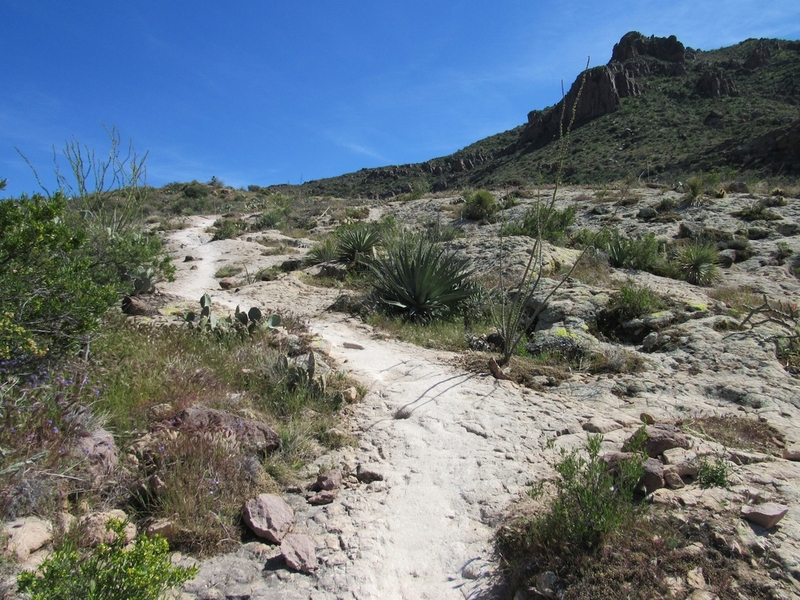 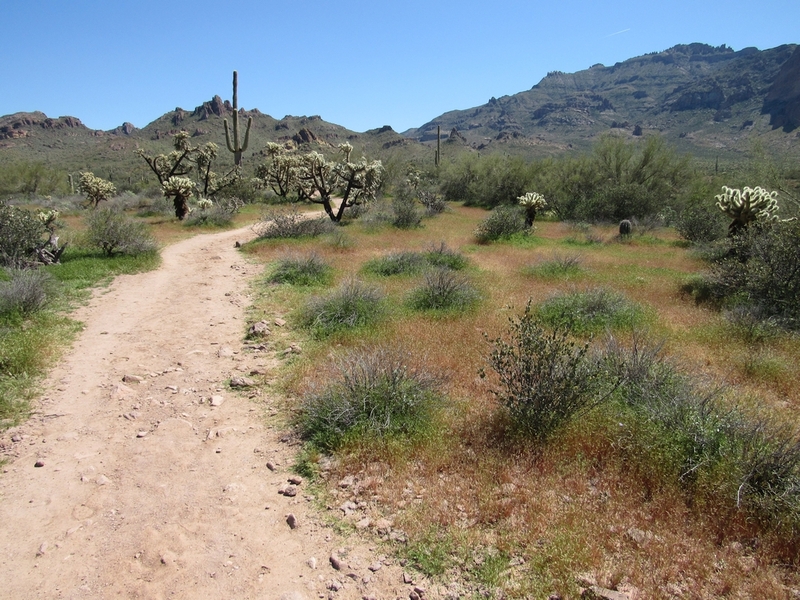 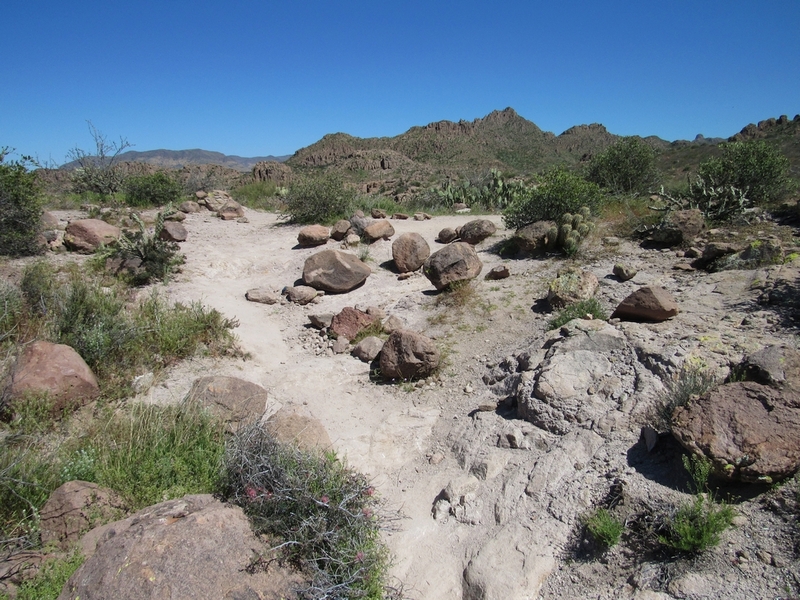 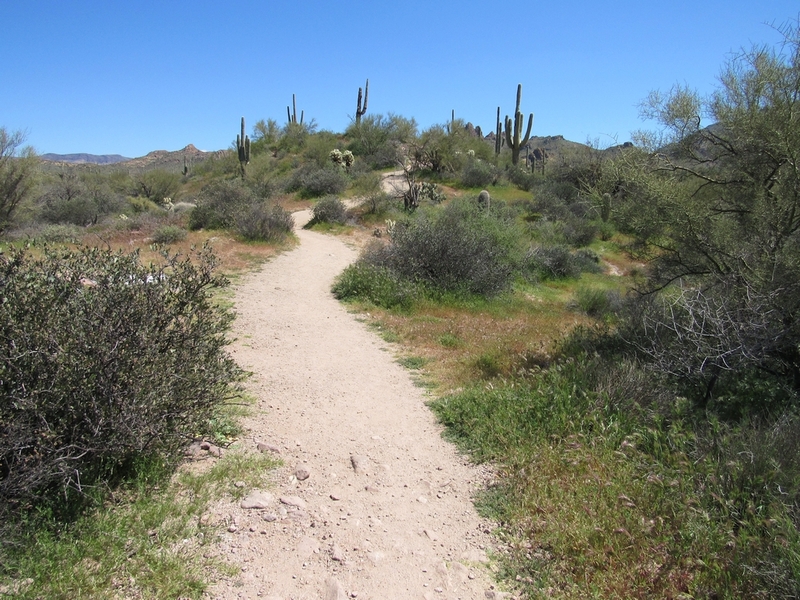 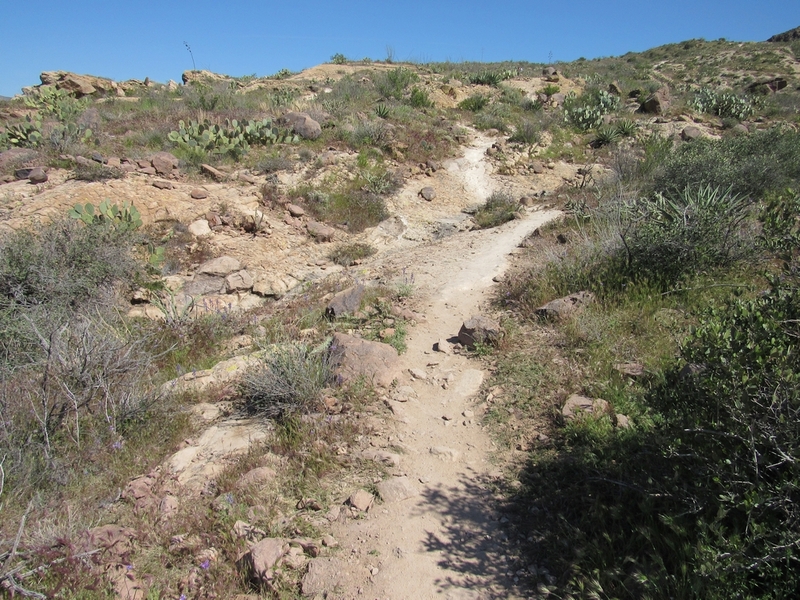 The old road to the trailhead has been closed, plowed, and returned to the desert. 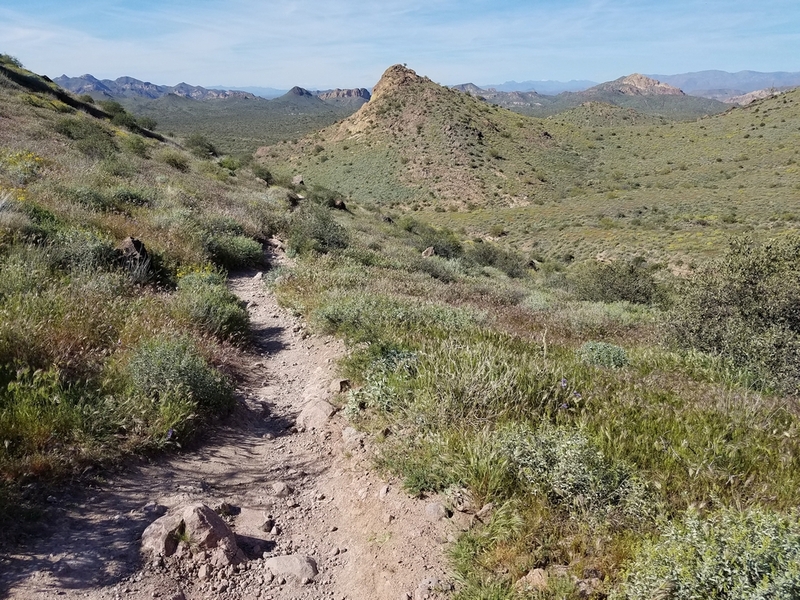 To get to Massacre Grounds Trail you have to hike from the new trailhead starting from the parking lot at Jacob’s Crosscut Trail. 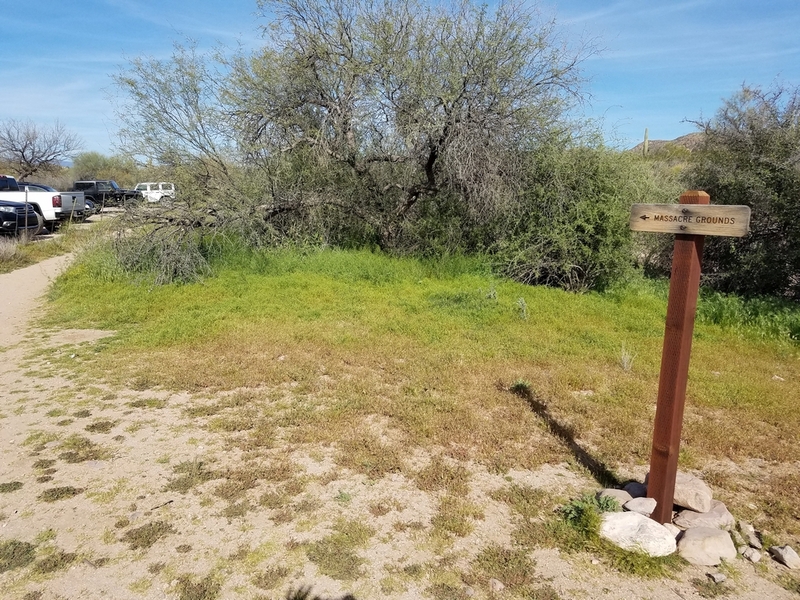 The Massacre Grounds Trail starts on the east end of the parking lot where you will find the foundation of an old building. 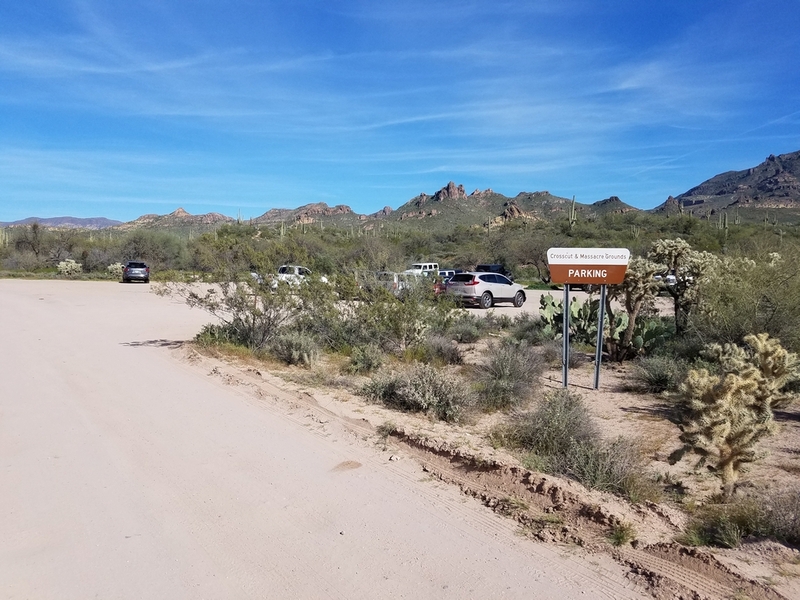 After hiking 0.8 miles you will reach the old parking area for the original trailhead. 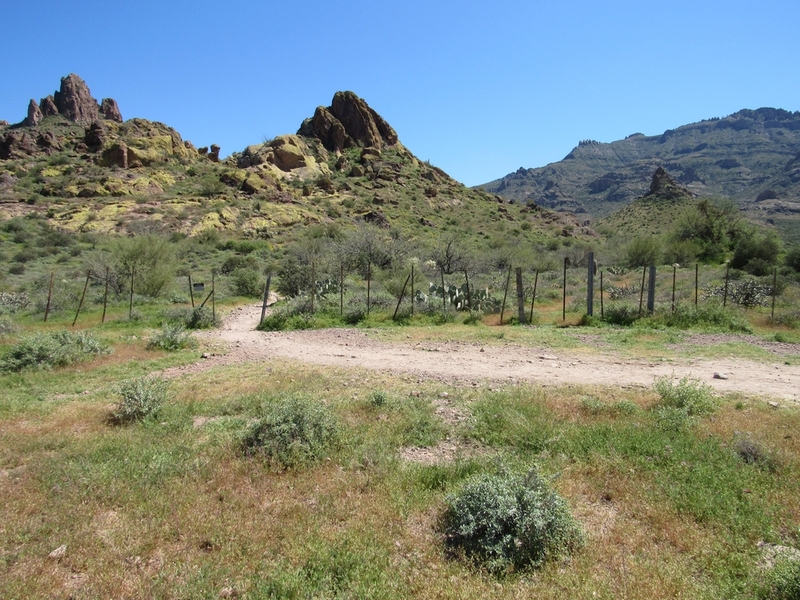 From there you will find a small opening through the fence crossing the border into the Superstition Wilderness and onto the trail to Massacre Falls. 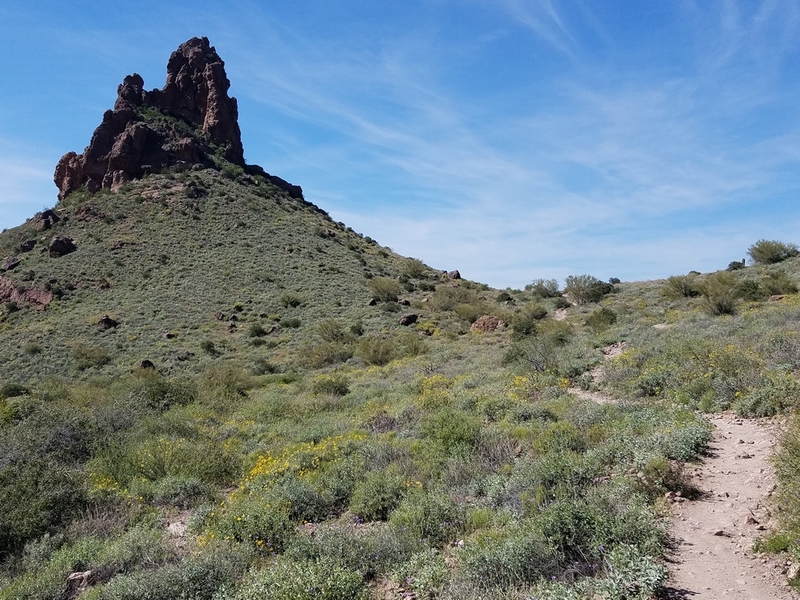 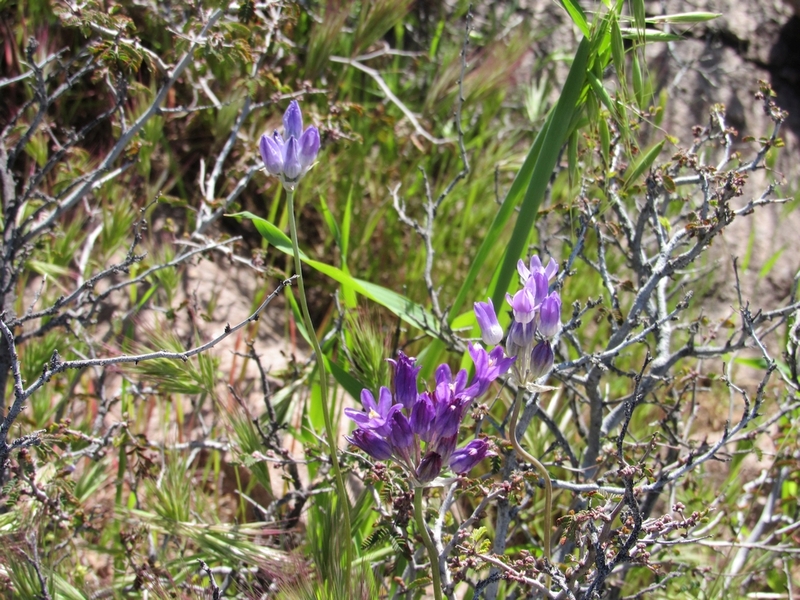 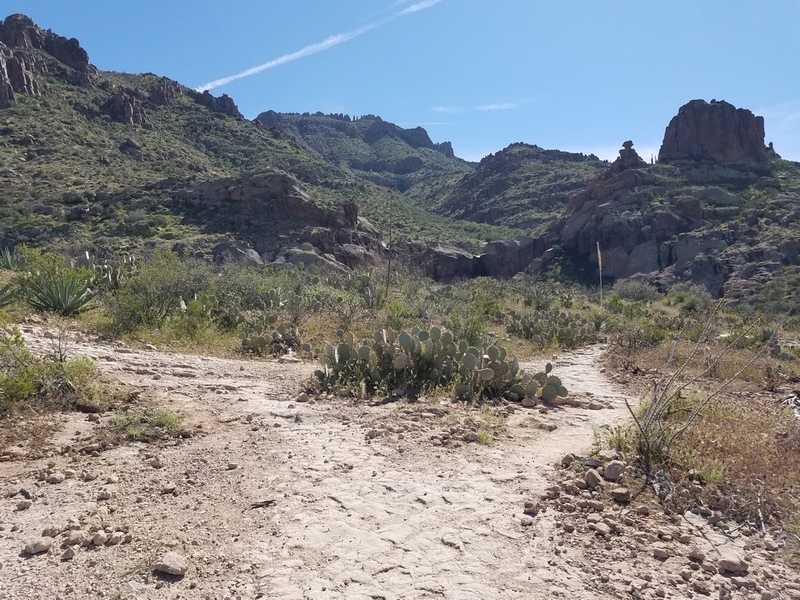 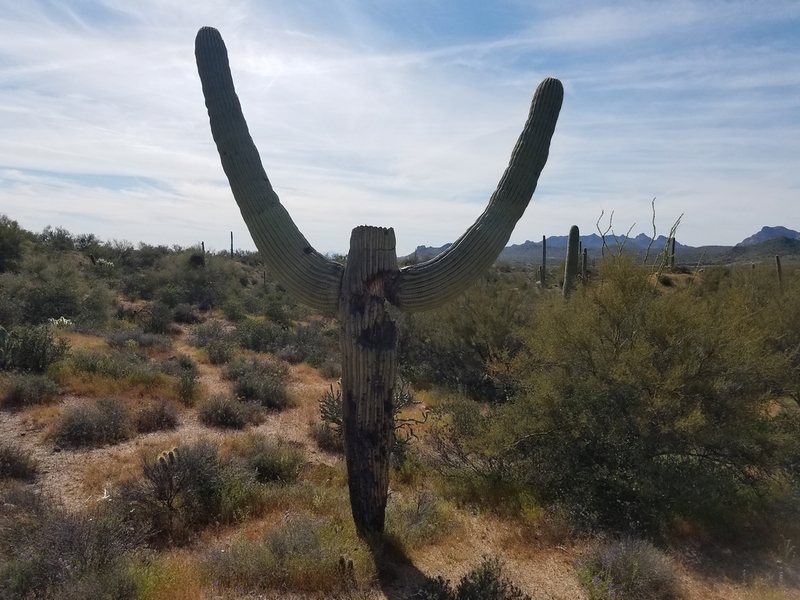 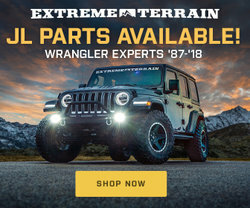 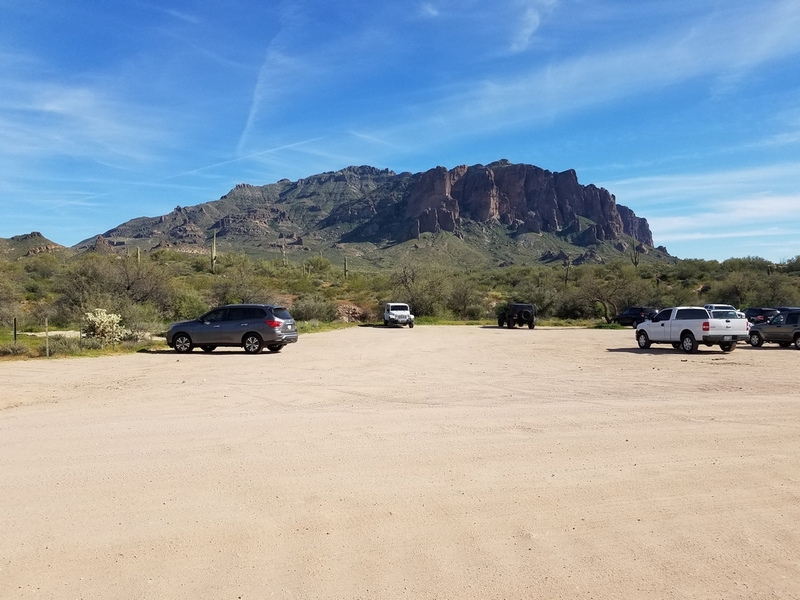 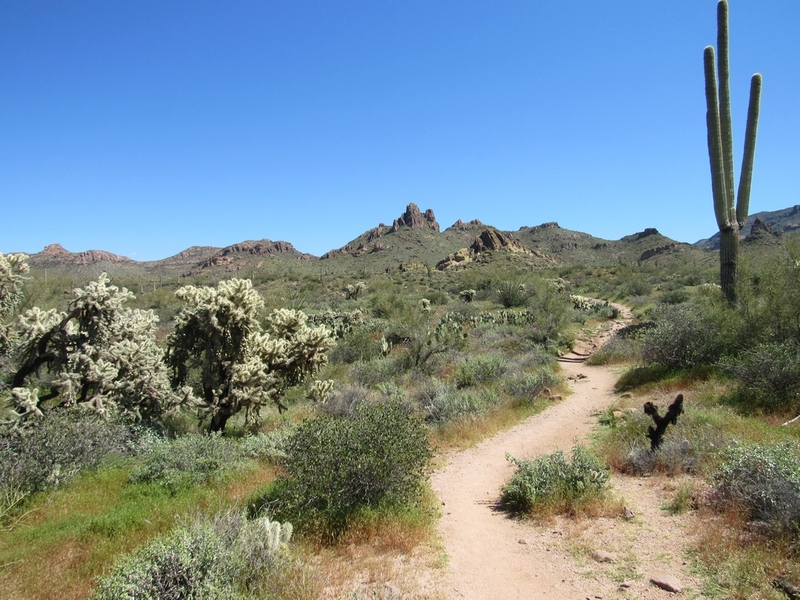 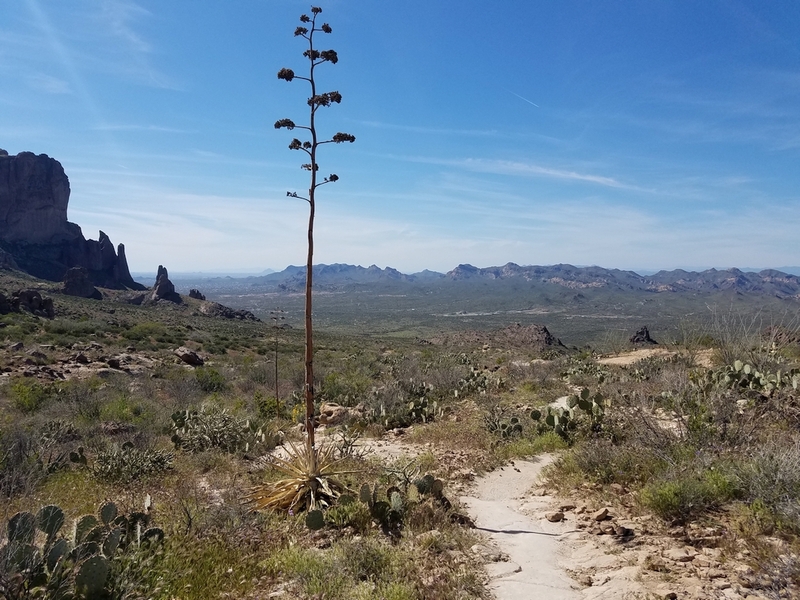 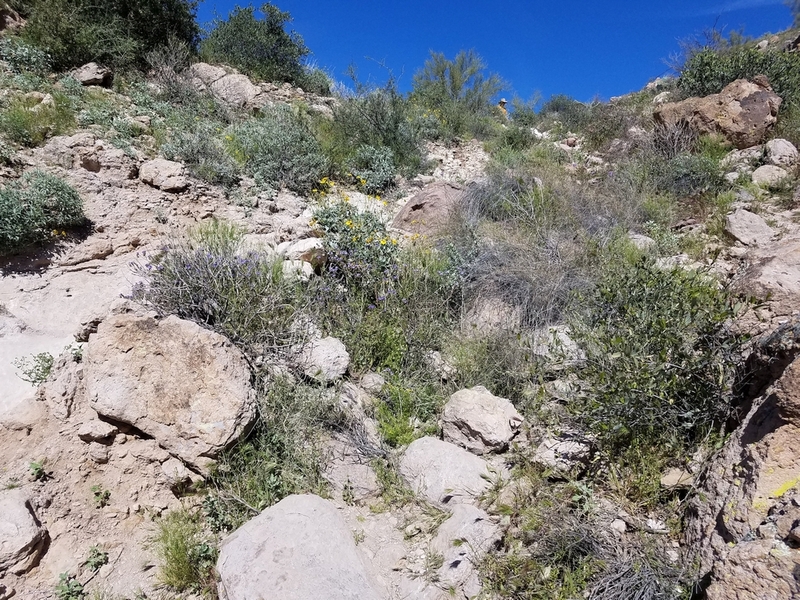 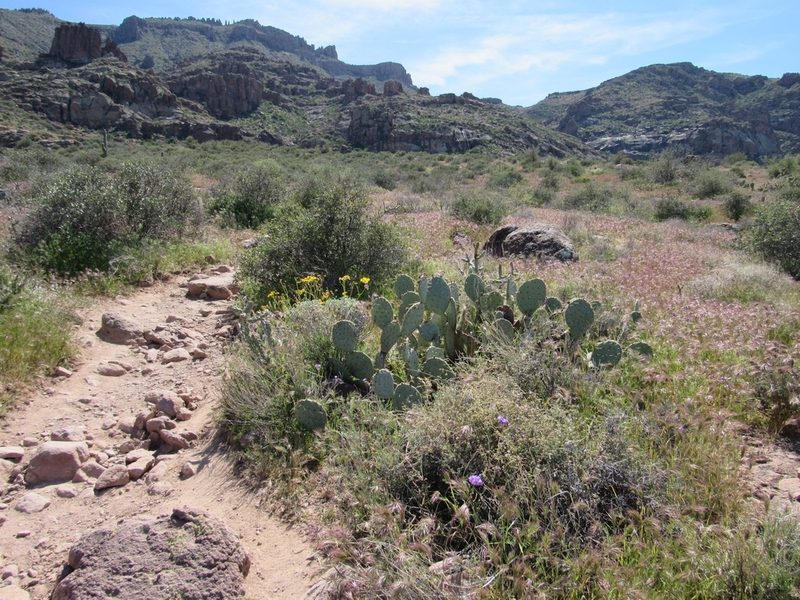 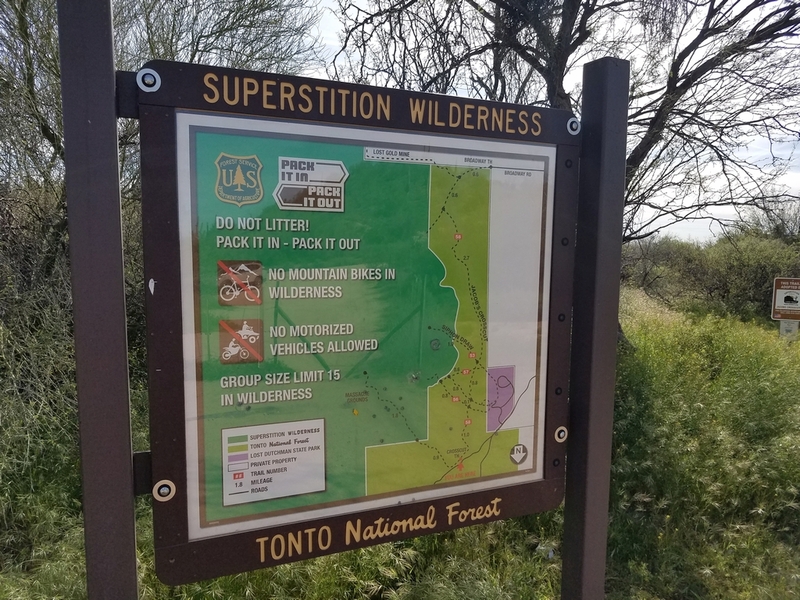 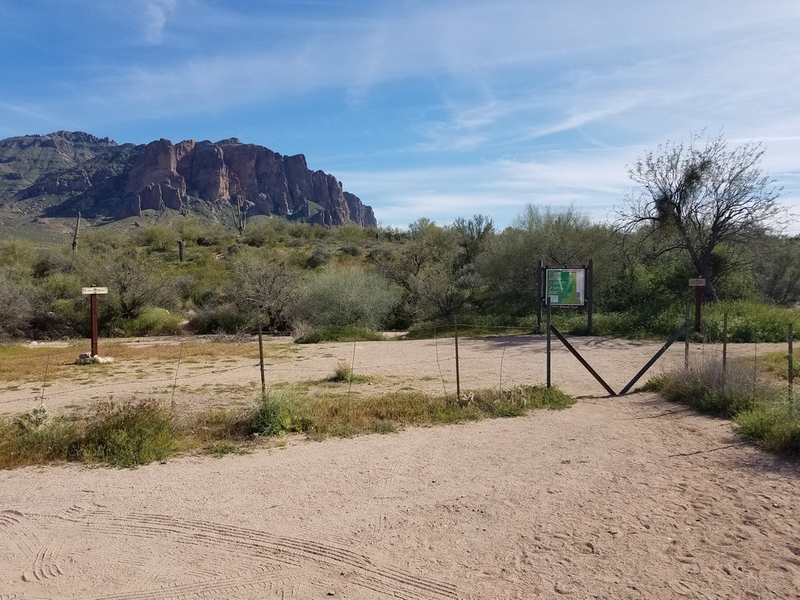 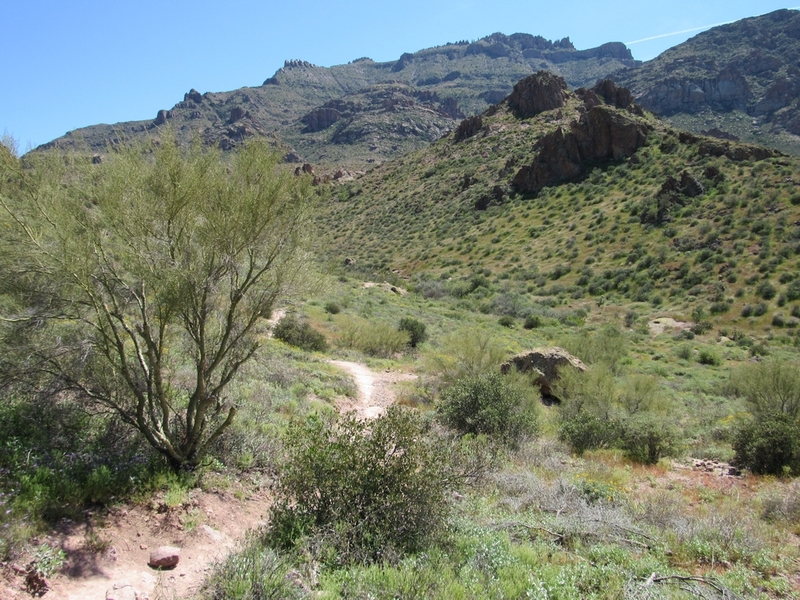 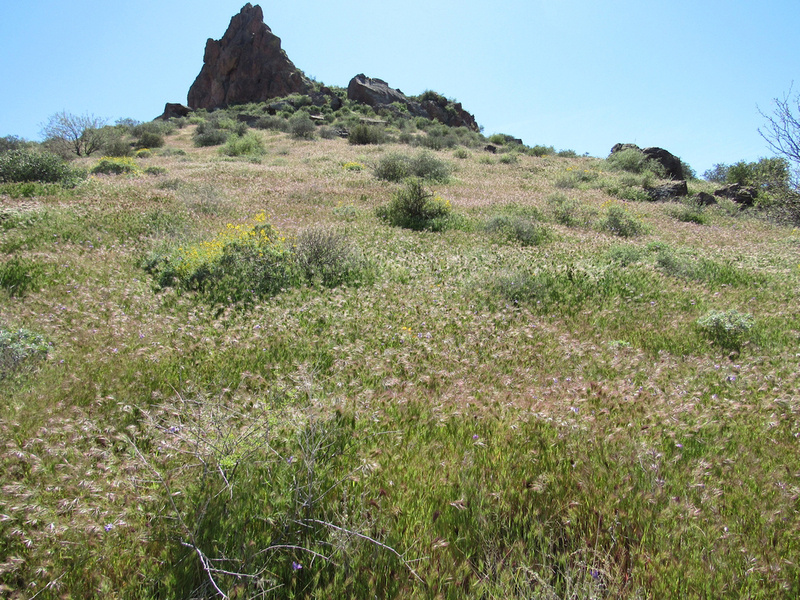 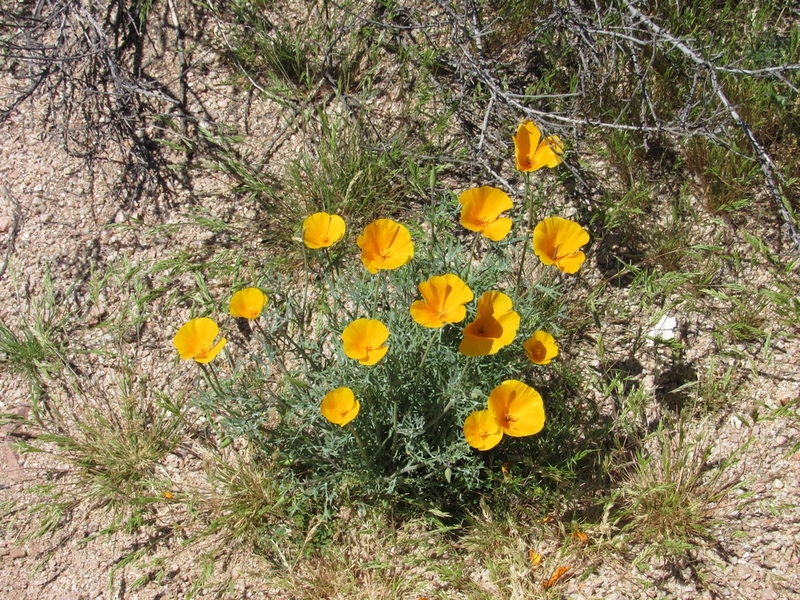 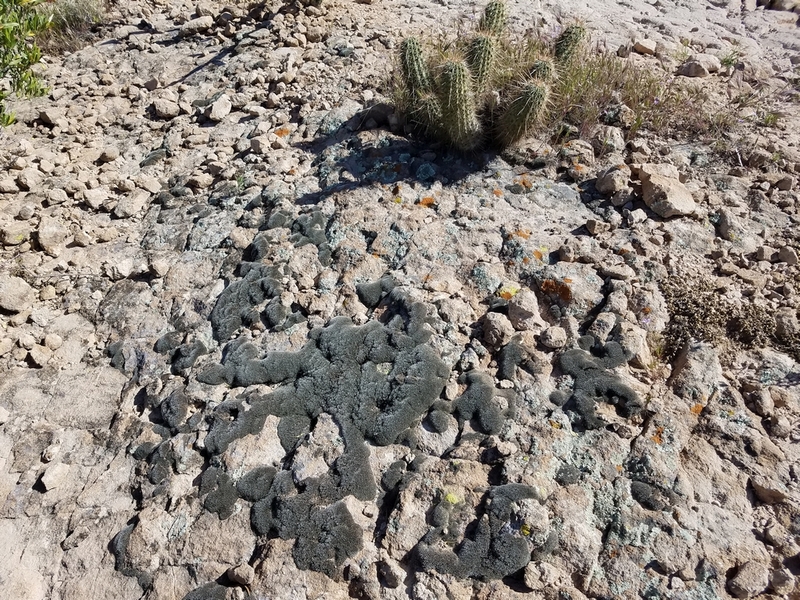 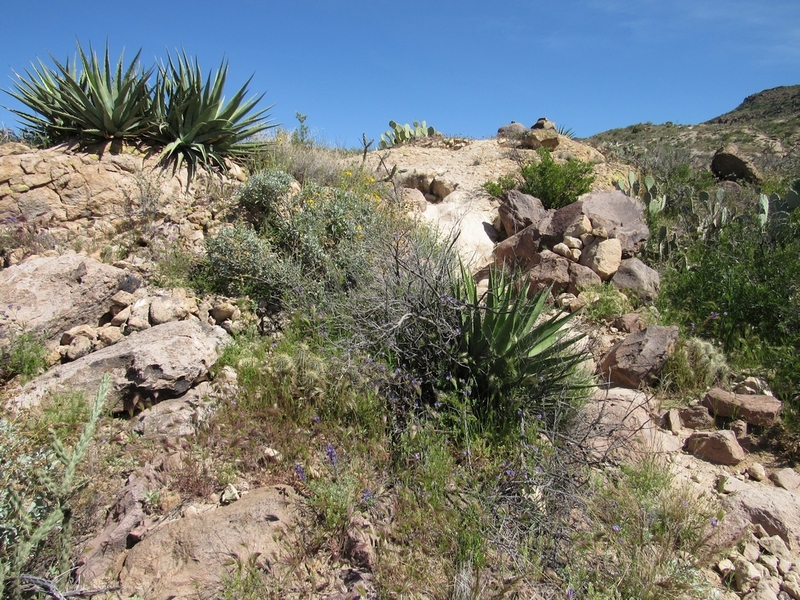 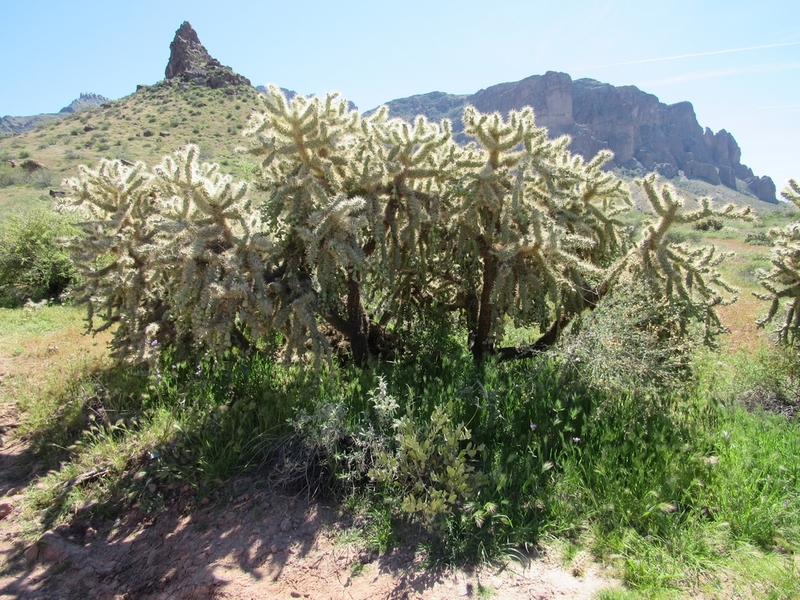 A short distance after crossing into the wilderness boundary, you will begin to gain elevation as you make your way up to a vista overlooking the vast Superstition Mountains. 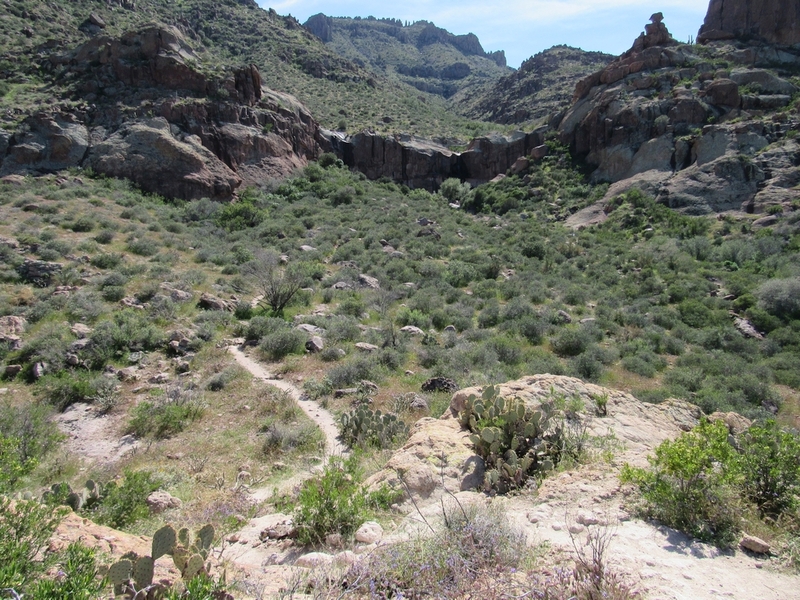 You can see for miles from this viewpoint. 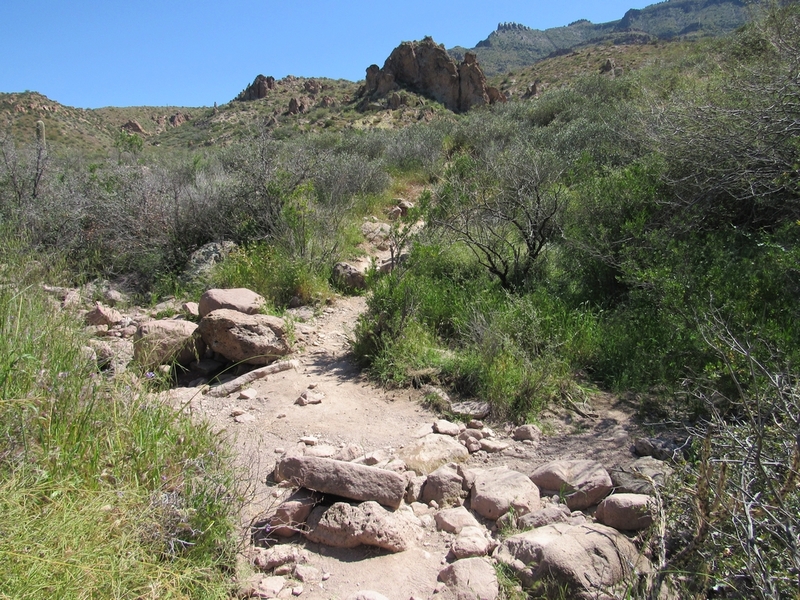 Most of the trail is pretty easy to follow, but the approach to Massacre Falls can be a little tricky to navigate. 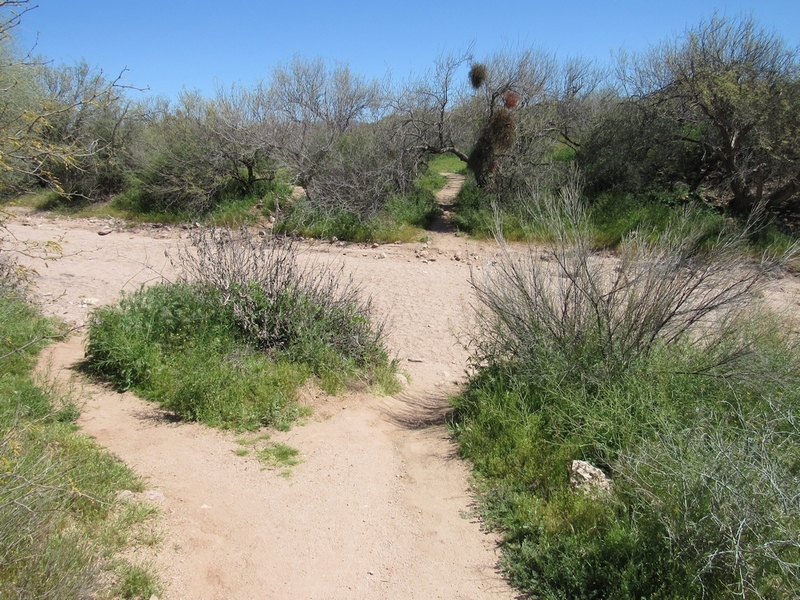 The trail seems to split just before the falls. 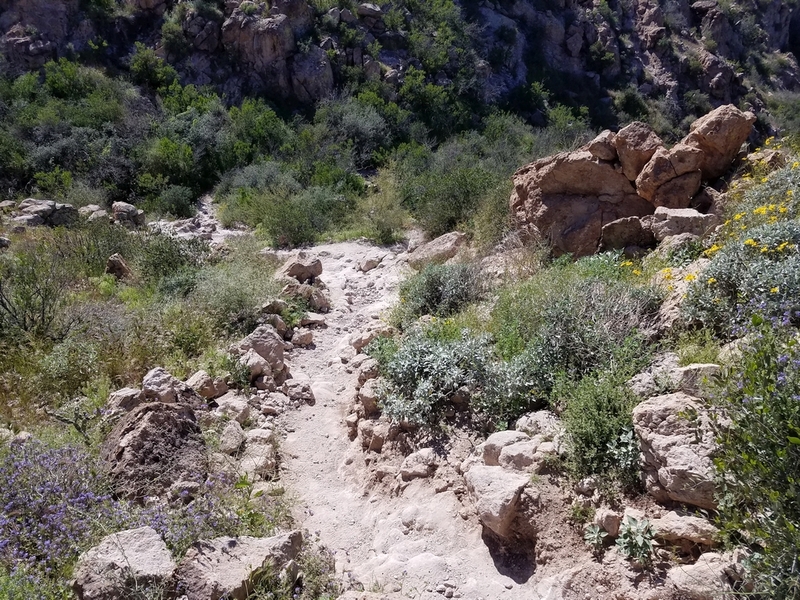 If you continue straight you will find yourself at the top of a sheer cliff; although the views are incredible, this is not the trail to the falls (it is the location where, according to the legend, the massacre happened). 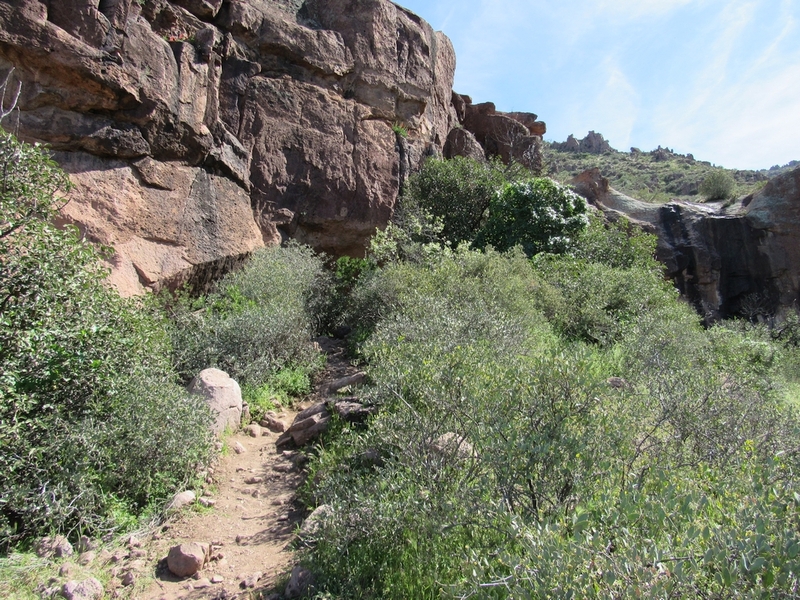 If you follow the trail to the right it will take you along the bottom of the cliff and toward the mountains. 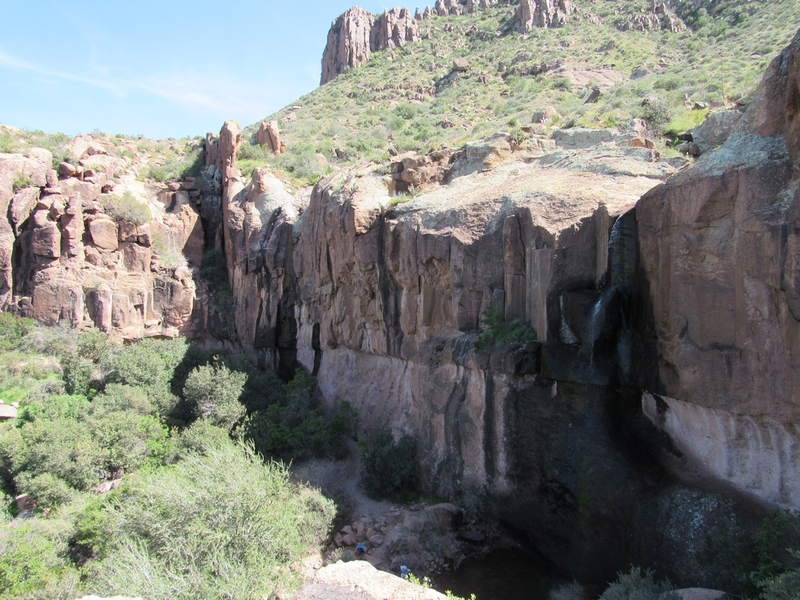 The falls are a short distance from here and can be spotted if you look to the west. 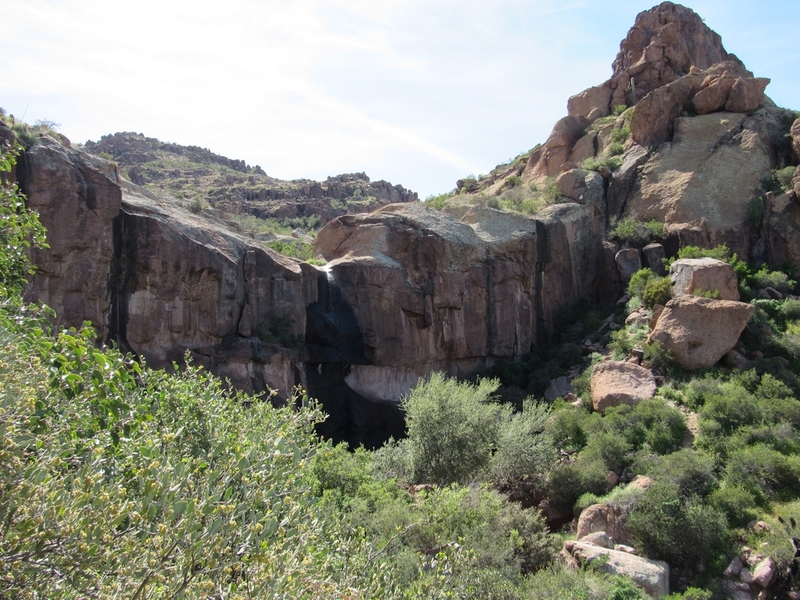 Most often the falls are just a small trickle of water. 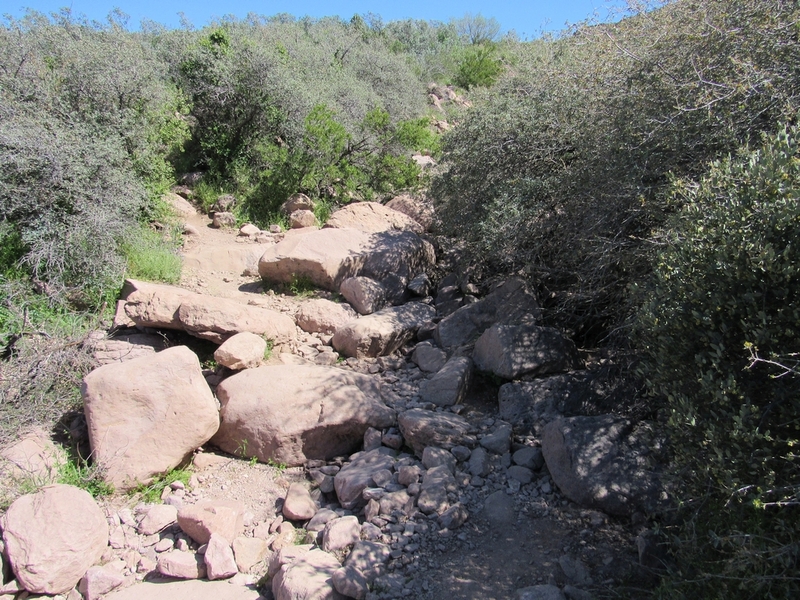 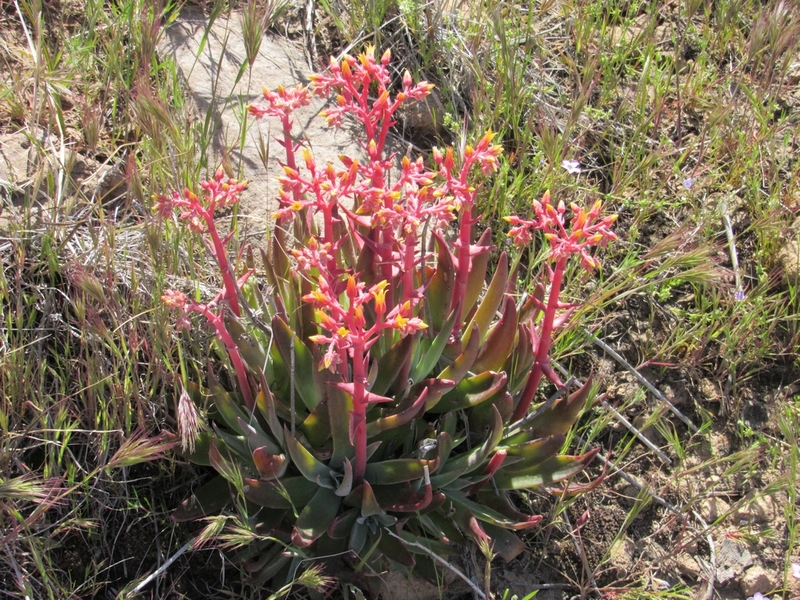 In the hot summer months there may be no water flowing at all. 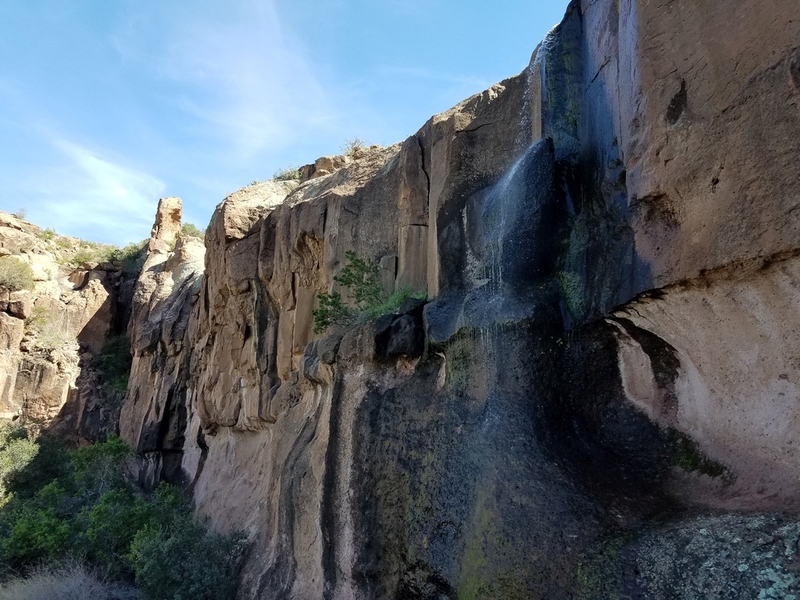 The best time to see the falls is right after a good rain and in the spring. 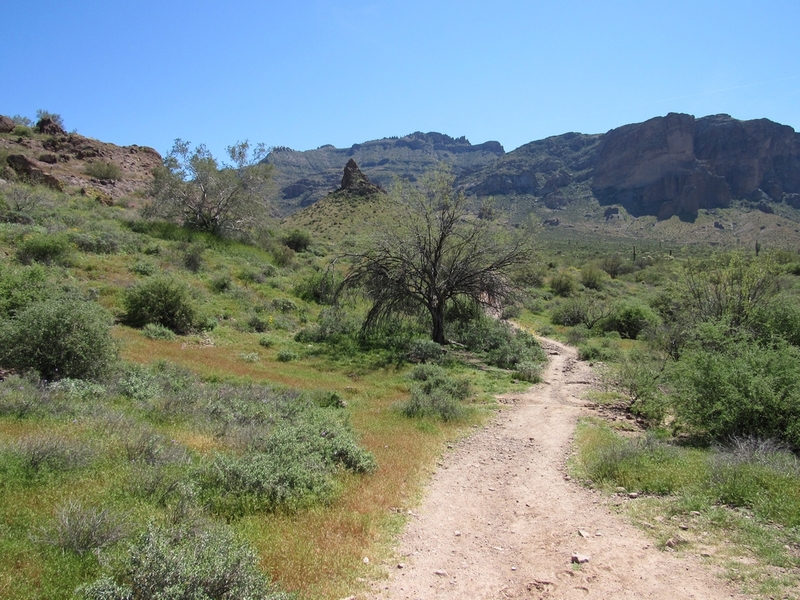 The Massacre Grounds Trail is a great hike. 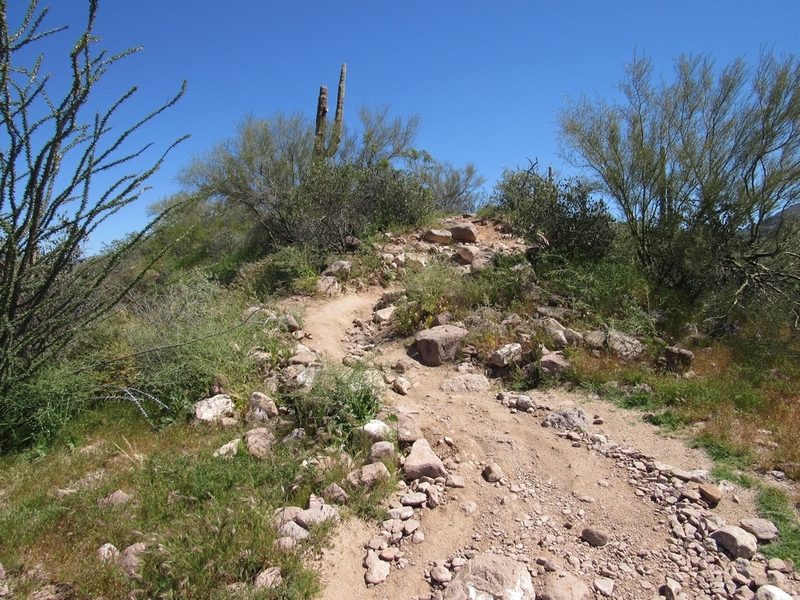 It’s rugged in some spots, with awesome views the entire way out and back. 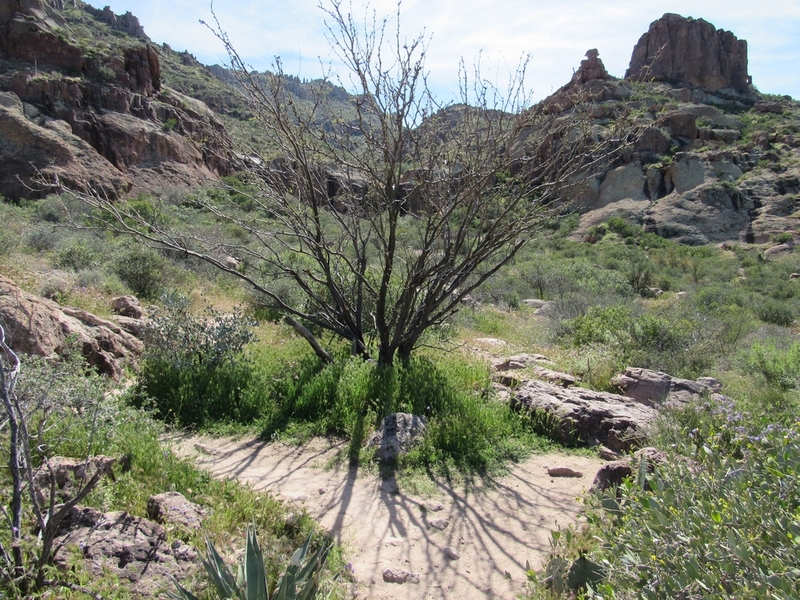 There is very little shade however, so remember to bring a hat and always carry enough water. 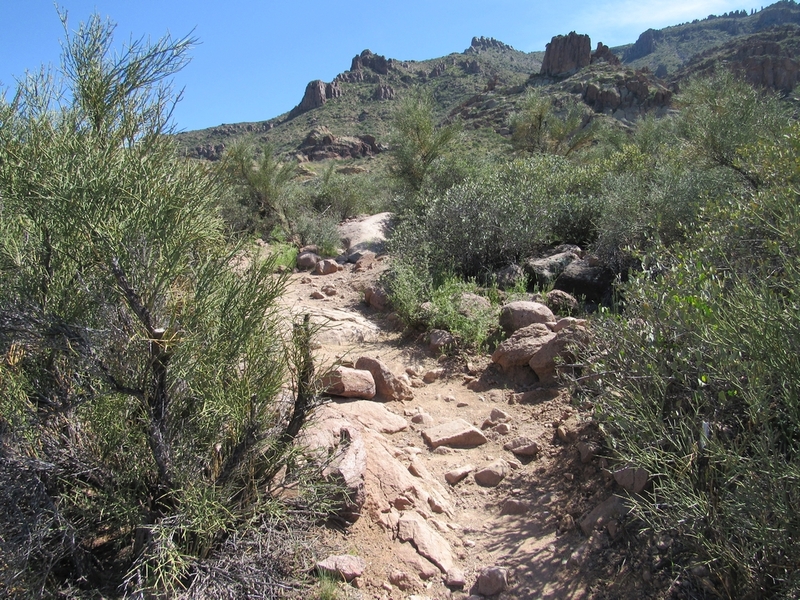 Plan about 3-4 hours for the entire hike, depending on your fitness level and how long you want to spend at the falls.